The Hampton Inn Gettysburg hotel in Pennsylvania is located in northeast Gettysburg on Highway 30 just west of Highway 15. Area attractions near the Gettysburg Pennsylvania Hampton Inn are the Gettysburg National Park Gettysburg Battle Theater Hall of the President and Cyclorama. Additional attractions include battle re-creations the state museum an amusement park and aquarium. Hotel guests can dine at the nearby Gettysburg Family Restaurant Hoss Steak House Perkins Family Restaurant or Wendy*s. The Gettysburg Hampton Inn in Pennsylvania features 79 hotel rooms filled with amenities including a refrigerator coffeemaker iron ironing board and hair dryer as well as complimentary high-speed internet and cable TV with HBO. This Gettysburg Pennsylvania hotel also offers suites with fireplaces and whirlpools two bedroom family units connecting rooms and cribs and for the convenience of our guests an on-site coin laundry. 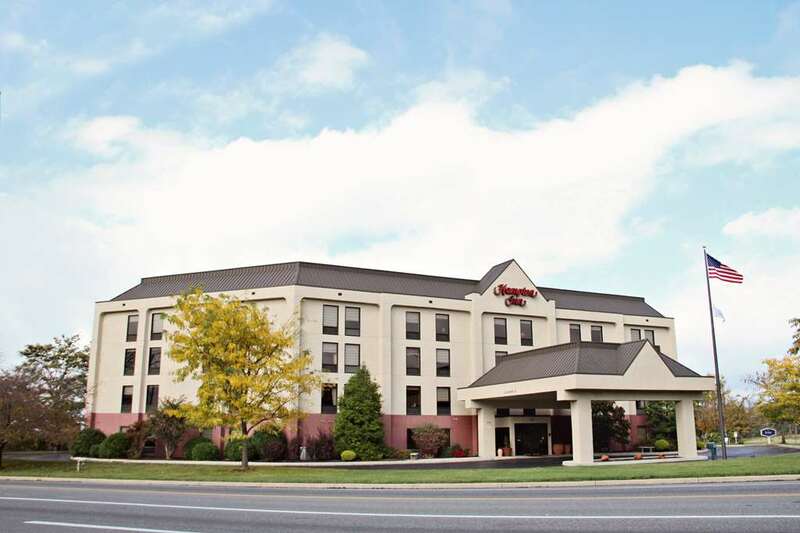 Sure to please the busy executive or leisure traveler Gettysburg Hampton Inn hotel guests can enjoy our complimentary On the House hot breakfast buffet served daily and Monday through Friday complimentary On the Run breakfast bags and USA Today newspaper. Guests staying at the Gettysburg Pennsylvania Hampton Inn can enjoy the convenience of complimentary wireless high-speed internet in the hotel lobby meeting rooms and all public areas as well as coffee and tea 24 hours a day in the hotel lobby. Hampton Inn Gettysburg Pennsylvania hotel guests can have fun in the indoor heated swimming pool work out in our fitness center or utilize the hotel meeting and banquet room. All stays at the Hampton Inn Gettysburg hotel in Pennsylvania are backed by our 100 satisfaction guarantee. If you*re not satisfied we don*t expect you to pay. That*s 100 Hampton. We love having you here at the Hampton Inn Gettysburg Pennsylvania. Blue Parrot Bistro: Looking for something more. This restaurant may be just for you. Featuring delectable entrees with a distinct Mediterranean flair this locally owned fine dining experience is one of the best Gettysburg has to offer.